Being disabled can make everyday tasks difficult to complete, but there are ways to ease the cost of purchasing the equipment you require.If you need a manual wheelchair, you can access the voucher scheme that will cover part, or all, of the cost, or you can contact voluntary organisation, Mobility Scheme, that allows hire or purchase of a powered wheelchair. The voucher scheme was created to widen the choice of wheelchairs available to disabled people. Each region has a locally assigned service that decides how the scheme is applied. When you have your initial assessment for your need for a wheelchair, you will be given three options. Firstly, the standard option allows you access to a wheelchair and any repairs or maintenance for free. The partnership option means that you can choose an alternative wheelchair to the one that you were assessed as needing - so basically, you can purchase one of a higher standard than that provided by the NHS.In order to do this, you will have to pay the difference between the actual cost of the wheelchair and the voucher that you have been provided with.The wheelchair you choose will still be maintained and repaired for free, provided you choose a wheelchair from a supplier that is approved by your local service. The third is the independent option. This is similar to the one above, but you own the wheelchair outright and are solely responsible for its upkeep. However, you will be eligible for a voucher to cover the expected cost of repairs and maintenance. The Mobility Scheme is another option for wheelchair users. Now, although this scheme doesn't offer wheelchairs for free, they do provide disabled people with the option to buy or hire powered wheelchairs at an affordable price. The Scheme is available to anyone who receives either the Higher Rate Mobility Component of the Disability Living Allowance or the War Pensioners' Mobility Supplement.Those who take advantage of this scheme are usually not eligible for an NHS wheelchair, or they have chosen to buy or hire the wheelchair themselves. Some are referred to the scheme by charities such as the British Red Cross.And, when it comes to learning how to use your new wheelchair, organisations such as Whizz-Kidz are on hand to help out. 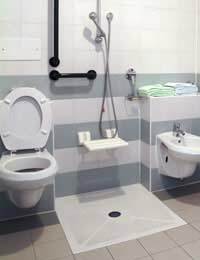 Disabled Facilities Grants are available from local councils to help pay for necessary adaptations to your home.Formed by the government, this grant enables disabled people to adapt their home so that they can continue to live there, including the building of ramps to enable wheelchair access. The first step in this process is to request that an occupational therapist come out and assess your home. This will provide you with a better idea of what adaptations you will require. Then you can start the application process. Firstly, you need to contact your local council - specifically the housing or environmental health department. It is important to bear in mind that your application won't be accepted if you have already started carrying out the work on your property, but the council are under obligation to notify you of the outcome of your application within six months. As in a full time carer to my partner whom suffers wv mental illness its hard to get him to appointments and so on as he won't use public transport for reason due to his illness is they anywhere I can get help towards the cost of driving lessons. Ask your local council Social Services for a Carer's Assessment. If successsful they may agree to fund a number of driving lessons through your partner's Direct Payments. Also look forlocal carers groups and Crossroads schemes in your area, they can sometimes help with this. You may be eligible for a Disabled facilities grant ? Here a link to the NI Motability scheme. Is your mother in receipt of any kind of mobility allowance etc? Here is a useful resource that lists all the places you can access benefits or grants for disabilities. @wheels. You may also be able to get some assistance from a care organisation if you need it. Ask social services for some information in the first instance. You may also find information on additional grants via the Turn to Us organisation. @help. Here's how to apply for a disabled facilities grant. I am in receipt of the highest mobility is . it possible to get a grant for having a hoist fitted in my car. I have a small scooter in the boot, my husband is now 76 and has angina soI worry about him lifting it in and out of the car. .